Giulio Ettore Degani was born on September 15, 1875 into an Italian dynasty of violin makers and artists. He was initially trained as a violinist and became a professional musician and teacher as well as a violin maker. Giulio was the grandson of Domenico Degani (1820–1887) and the son of Eugenio Degani (1842–1901), who is today considered the founder of the modern Venetian school of violin making. In 1867 the family had moved to Montagnana, where Giulio and his siblings (Rosina, Marina and Melia) were born. During this period his father Eugenio became a maker of global reputation, winning 15 medals internationally. After Domenico Degani’s death in 1888, Eugenio and his family moved to Venice. As World War I raged across Europe, Giulio Degani received an invitation to work for the Wurlitzer firm in New York and on October 5, 1915 he set sail from Genoa with his friend and protégé Jago Peternella, who was 11 years his junior. They arrived at Ellis Island on October 19. In Degani’s declaration he was described as a ‘Merchant Trader’ and stated his final destination as New York City. As a diabetic, he was not eligible to join up to fight in the war and this condition also explains a lot about his work later in his life. In October 1918 Degani took up his post in Wurlitzer’s Cincinnati branch. He settled at 2232 Boone Street and apparently encouraged his family back in Italy to emigrate. In December 1920 his nephew and niece, Gino and Amelia Bellini (the children of his sister Marina), sailed to join him in Cincinnati. The following year Degani left the Wurlitzer Co. and moved to a larger house a few blocks from the Ohio River at 2164 Florence Avenue, where he opened his own shop. In the 1922 Cincinnati Directory both he and James Reynolds Carlisle (known at that time as the ‘Stradivari of Kentucky’ and who had also been employed by Wurlitzer) were listed as independent violin makers. Some previous accounts of Degani’s life have suggested that he found himself isolated in Cincinnati among violin makers of largely Germanic origin, but in fact the census records of the time show that his neighborhood was a melting pot of nationalities that included Italian, Russian, German and English immigrants. During this period Gino Bellini, despite being an artist and lithographer by trade, appears to have helped his uncle in his workshop: in 1921–22 he is listed as a violin maker in the Cincinnati Directory at Degani’s address. After a few years Degani and his niece Amelia briefly resettled in Norwood (now part of greater Cincinnati), where Amelia met Salvatore Buglione. By this time Degani was living with a widow, Giaccinta Sebastianelli Bartolo. 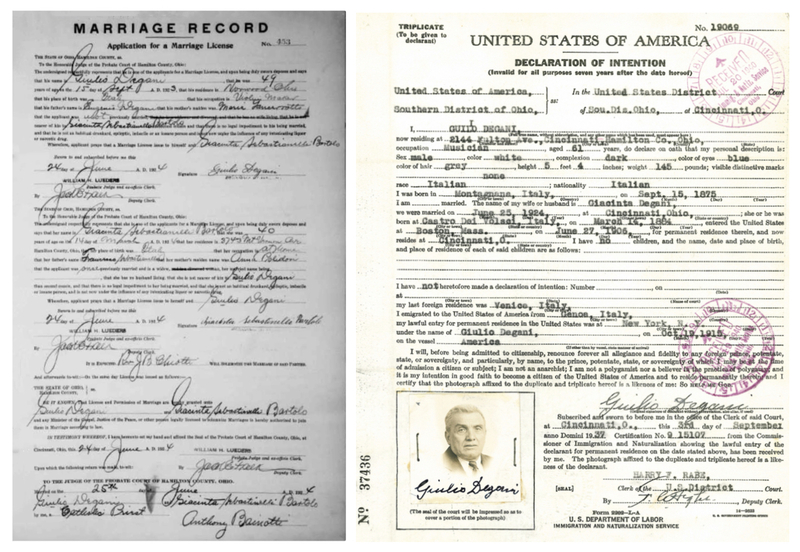 Both couples decided to get married on the same day, June 25, 1924, and all four subsequently lived at the same house. In 1925 Amelia gave birth to her first child, Maria, and by 1926 Giulio had moved his growing family to 2144 Fulton Avenue, where the Buglione and Degani families continued to reside together. The following year Amelia gave birth to a son, John, but tragedy struck in early 1929 when Amelia contracted influenza and died soon afterwards, on January 13. In October of the same year came the worst stock market crash in US history. For immigrants like Degani, their dreams of finding a more prosperous life in America came to a halt. Despite this and the recent family tragedy, Degani continued to produce instruments during this period, including several violins and a cello. According to the US Census of 1930, he already owned his home, which was worth $8,000. But as the Great Depression set in, hardship increased. The Cincinnati Symphony reduced its 1933–34 season to 16 pairs of concerts and introduced salary cuts of one-third for the whole orchestra, while Ohio’s unemployment rate reached 37.3% in 1932. By the end of 1933 Degani had decided to move back to Atlantic City, where opportunities for musicians were more abundant; another factor in his decision may have been the presence of Peternella, who had returned to Atlantic City around 1930 (see our previous feature on Peternella). The outbreak of World War II formally ended the years of depression, as millions of men and women went to work for the war effort. Degani joined the Baldwin Factory in the Walnut Hills area of Cincinnati to build wings of airplanes. After the war he worked as a farmer for a Mr Lianisi in Ohio, all the while maintaining his violin shop part time. This explains the scarcity of instruments by him during this decade. Nevertheless, as a maker Degani appears to have been popular with players from the Cincinnati Symphony and he made a fine double bass for Louis Winsel, the principal bass, which is now owned by Paul Robinson. He received his US citizenship on April 29, 1941 and his annual reported income for the year 1939 was $1,560. Given the median income for a man at this time was $956, Degani was doing pretty well. Giulio Degani had great skills as a maker, but he suffered ill health and poor eyesight during the later years of his life; we also now know that due to financial difficulties he worked only part-time as a maker after the onset of World War II until his retirement. Overall his story is one of love of family and the need for personal sacrifice rather than the pursuit of individualistic goals during the hardships of depression-era America. With thanks to the Degani and Peternella families, Eric Blot, Philip J. Kass, Duane Rosengard and Jim Warren. Gennady Filimonov is a violinist in the Seattle Symphony and founder of Filimonov Fine Violins. Next week Dmitry Gindin analyses Degani’s fine instruments and his place in the Venetian school. Advert by Chas. Begg and Co. Ltd, London 1917. 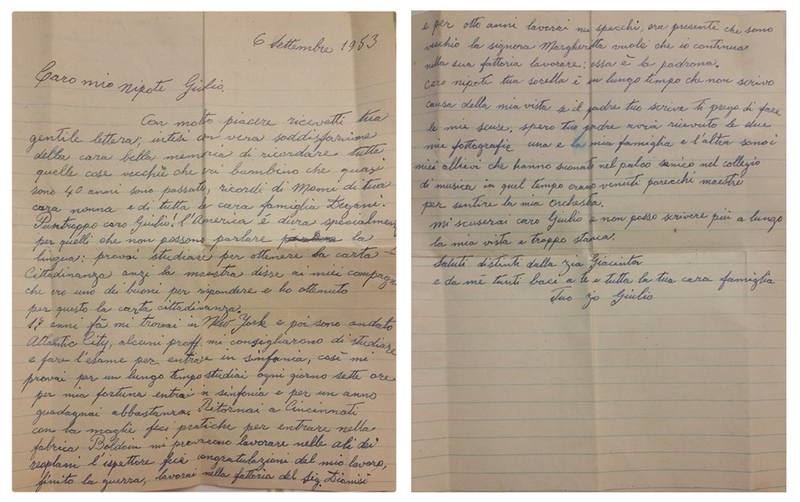 Letter from Giulio Degani to Giulio Vaccari, September 6, 1953. Wurlitzer Company Records 1860–1984, NMAH.AC.0469, Smithsonian Institution. In the 1980s Duane Rosengard was shown a business card from New York City that featured both Giulio Degani and Jago Peternella’s names and read ‘Corner of 6th Avenue’, suggesting it was situated at the 104 West 52nd Street shop. The Cincinnati Post, January 8, 1949. Letter from Giulio Degani to Giulio Vaccari, Op. cit. Cincinnati Post, May 22, 1959.